Many of the world’s greatest fly-fishing locales are situated within easy driving distance from Salt Lake City. 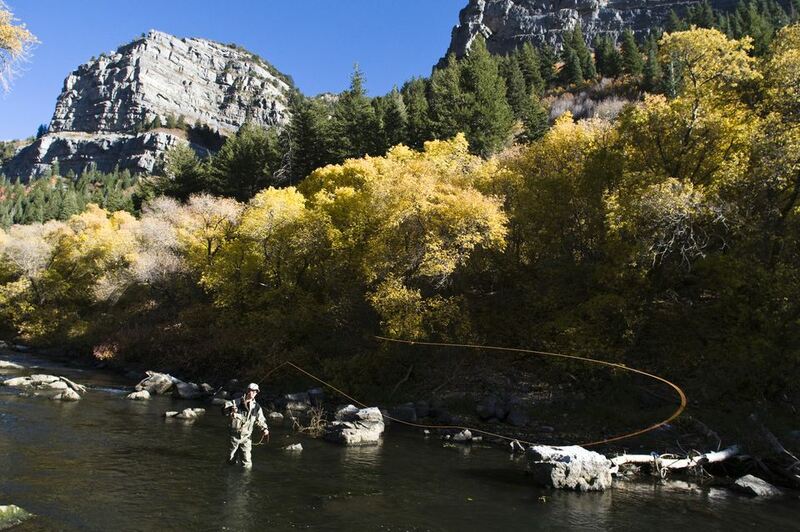 Here are the five best spots to cast a fly near SLC. The Provo River is the most popular fly fishing water in Utah. The Provo is divided into three sections with lakes on each end. The Upper Provo flows west and south from Trial Lake in the Uinta Mountains to Jordanelle Reservoir. The Upper Provo has cutthroat, rainbow, brown, and brook trout and offers fast fishing and amazing scenery. The Middle Provo flows from Jordanelle Reservoir through Heber Valley to Deer Creek Reservoir and is home to numerous brown and rainbow trout. The Lower Provo River flows from Deer Creek reservoir through scenic Provo Canyon to Utah Lake. It supports mostly brown trout. Being extremely high in nutrients, the Lower Provo River holds more trout for its size than almost any other river in the U.S. The world famous Green River is about three hours by car from Salt Lake City, but the drive is worth it. The Green River boasts more sizeable trout per mile than any other river in the United States. With crystal clear waters and deep pools, a float trip down the Green River can seem like a trip to a trout aquarium. The chance to see thousands of fish and watch them as they take your fly makes the Green truly unique. The Green River is best fished from a drift boat, but what is known locally as the A section (Flaming Gorge Dam to Little Hole) also has a stream-side trail offering access to wading anglers. Trout here are unusually wary, so it is best to visit the local fly shop for information on which flies to cast or to hire a guide. The Weber River begins high in the western Uinta Mountains and runs west and north until it eventually empties into the Great Salt Lake. The best fly fishing sections of the Weber River lie above Rockport Reservoir and between Rockport Reservoir and Echo Reservoir about 30 to 45 minutes east of Salt Lake City and 15 minutes from Park City. The Weber River is very accessible from the frontage road that parallels Interstate 80 between the towns of Wanship and Coalville. The Weber holds mostly brown trout with some rainbows and cutthroats as well. The Weber has some very large brown trout, but not as many fish as the nearby Provo. It is best fished with nymphs most of the year but can have an occasional hatch that brings fish to the surface. The Wasatch front’s Big and Little Cottonwood Canyons, Millcreek Canyon, and American Fork Canyon each hide small streams that offer great trout fishing for mostly small rainbow and brown trout. The beauty of these small streams is that they are located just minutes from downtown Salt Lake City, making them perfect for a quick getaway. Most anglers won’t find the trophy trout found in larger rivers like the Provo, Weber, and Green but the trout in the Wasatch Front canyons are eager and willing to take most flies. If you are a beginning fly fisher or are going without a guide, these spots offer the least sophisticated trout around, but beware that the wading can be tricky and the brush is tight to the water. Strawberry Reservoir is one of the premier fly fishing lakes in the United States. It is located about one hour from Salt Lake City by car along scenic Highway 40. Strawberry Reservoir is primarily a cutthroat trout fishery, but it also holds good numbers of rainbow trout and Kokanee salmon. The trout in Strawberry Reservoir grow quickly and can be quite large, often reaching between six and 10 pounds, with the average fish coming in around 16 to 20 inches and two to four pounds. Strawberry is best fished from a boat, pontoon boat, or float tube with a sinking line and streamers, leeches, and nymphs. Afternoon winds can be strong, so it is best to get there early and be cautious when fishing from a boat or float tube.